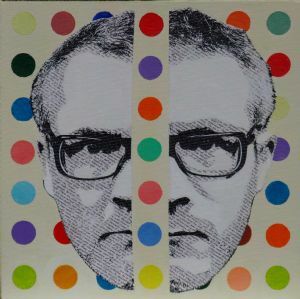 Description: Literally Damien Hirst Divided, a collage made up of Mr Hirst's bio, stuck onto a background of one of his dot's pictures. Cut in half as he is so famous for doing. Thanks to my friend Bob Shipp who suggested the divided aspect of the artwork.